When I experimented with drawings of wolves, I was aware that animal drawings are quite challenging for beginner artists. Since I was willing to try anyway, I prepared myself to accept whatever images evolved and I understand it is all for the sake of progress. This is a good mindset to have, it puts you in good stead for a great adventure! I discovered drawing a wolf was a little beyond my capablilities in my first year of drawing, as you can see by my efforts here on this page. I know they are not good drawings but I want to show you what is possible when you are not afraid to try. 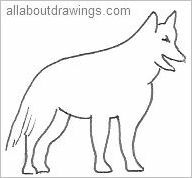 Here is an outline of a wolf for you to copy and practice sketching this animal. This template of a wolf drawing wasn't easy for me, especially with a felt tip pen. I wonder if it's only my mind that's telling me I can't draw animals? Everytime I did the outline, it looked like the wolf was laughing! Secretly, I knew that every single outline drawing was helping me to improve and persistence does pay off. My determination is going to set me on the right path of accomplishment. If you struggle with self-confidence, you need to override those limiting feelings and take control of what you want to achieve. Use this outline to copy and keep going until you are satisfied you've got it right. It is true that practice makes perfect. The tongue has not been included in the outline so just add it in by hanging it over the bottom lip. By all means, use a clear reference picture to help depict the subject properly. Then once that's finished and you are content your outline is good, you can start to add in the details. 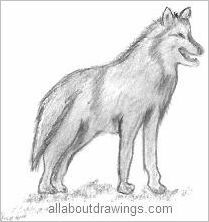 Keep in mind some of the traits (listed below) that are associated with a wolf as you draw. The wolf has long hair and his tail is quite bushy. People are afraid of wolves but little do they know, the wolf avoids people as much as possible. A wolf is one of the largest members of the dog family. It looks alot like a German Shepherd dog with similar coloring but the legs are longer and his head and feet are bigger. The wolf preys on large hoofed animals like deer and moose. A pack of wolves generally consists of around eight members and they live in an area called a territory. Howling wolves loudly warn other wolves to stay out of their territory otherwise the visiting wolves will be attacked. We associate a wolf with evil and we use sayings like "a wolf in sheep's clothing" to describe a person who is friendly but has bad intentions. Needless to say, the wolf isn't held in high esteem by us. There is always a beginning for anything we do. If you are patient and willing to learn, the art of drawing will be yours to command. Creating drawings of wolves is one little step on the road ahead. Take heart, every single one of us despairs if we will ever be able to draw successfully. Truth be told, I'm still a little uncertain myself until I put something on paper and then I stare in amazement that I actually achieved it! Like athletes, we need to push ourselves and keep pushing until we reach our goals. I use plain A4 photocopy paper to do my drawings of wolves because it's just as good as any sketch pad. 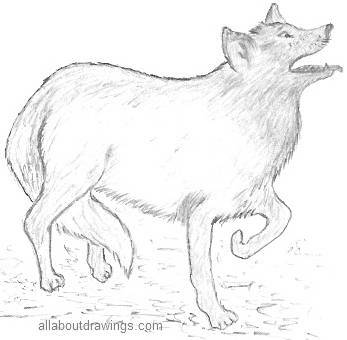 If you have been a hobby artist for a little while now, just see how you go with creating a few drawings of wolves. If you find it too difficult, continue practicing subjects that appeal to you and you'll automatically improve that way. You really do improve each time. I did these drawings of wolves when I first started to draw. I am still happy with them although I'd like to think I can draw better than that now - quite a few years later! Notice on this drawing how I kept drawing the line of his nose until I thought it was right. That is what you need to do to teach yourself to observe properly. Please remember to continue to put a date on all of your sketches. When you cultivate this habit, it becomes a good source of encouragement when you refer back and notice how far you have advanced. I guess it's lucky I do my drawings of wolves in pencil because I can keep erasing until I get a good likeness. I just love the person who invented erasers!